Folks from all walks of life and in all parts of the country enjoyed parties, dancing, and balls in 19th-century America. 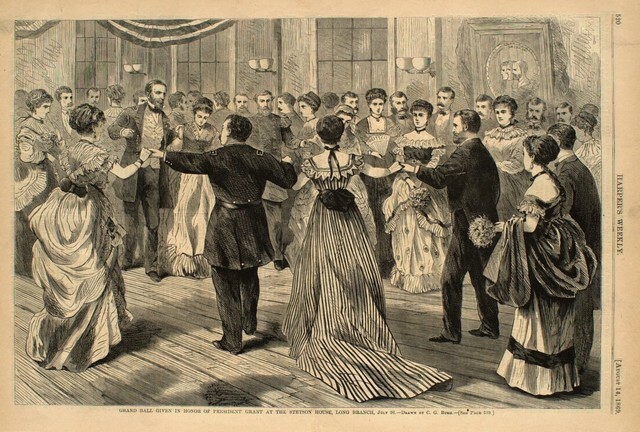 The caption on this wood engraving, which appeared in Harper's Weekly in 1869, reads "Grand Ball Given in Honor of President Grant at the Stetson House, Long Branch July 26." Harper's Weekly, Aug. 14, 1869: 520.
approx. 11 in. x 17 in. Bush, Charles Green (1842-1909), “"A grand ball",” OpenValley, accessed April 25, 2019, https://openvalley.org/items/show/34.